Knitting, the Universe, and Everything! Having a new teacup-human in the family (fantastic turn of phrase by AndiSocial) means that you get to knit lots of cute, tiny things. This weeks teacup-human knitting is the Jacket with Moss Stitch Bands and Moss Stitch Shoes, both of which are from the book Baby Knits for Beginners by Debbie Bliss. 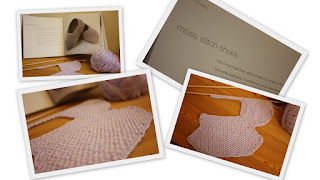 The Moss Stitch Shoes, are really pretty. And you'll probably remember me blogging about knitting them not too long ago. I forget why I ended up frogging them... but anyway! Now they're back, and I've really enjoyed knitting them! They were really easy to knit, and very fast too! They're sat in my knitting bag now... waiting to be sewn up. So hopefully on Sunday you'll get to see the finished result! It is basically stocking stitch with (you guessed it) moss stitch bands. As it is a 'mindless' knit, it has meant that I can read while knitting. Which is great news, because I'm really behind on my reading goal already this year. But, more on that tomorrow. So, now its time for you to head on over to Tami's where WIP Wednesday has reached its 80th week - can you believe it?? Have a great week everyone, and don't forget to pop on by tomorrow for the 2nd week of the Thursday Book Challenge! oooh love the colour. Might have to get hold of that debbie bliss book too. That's the best part of baby knits- how quickly they get made up! Awwww, everything looks so cute! Love the phrase "teacup-human" how cute!! Both projects are looking great! Baby items are always fun to knit up as they're quick and cute.